At first sight, Intel's latest Atom processors should be ideal for tablets and slates. But they seem to always disappoint, with performance just not quite what we'd expect. At first sight, Intel's latest Atom processors should be ideal for tablets and slates. But they seem to always disappoint, with performance just not quite what we'd expect. So it was with some trepidation we picked up the Oak Trail-powered Kupa X11, only to discover that here was a tablet that's light, easy to use and performs well, with good battery life. 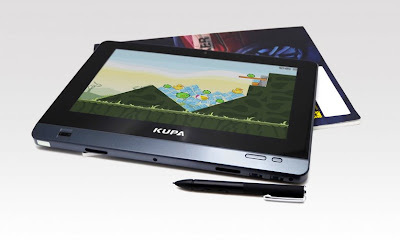 Kupa has given its tablet a hybrid touch-and-pen screen. Both work well, with nice and responsive finger touch on the 1,366-by-768-resolution screen. The battery-powered pen is easy to use, with smooth action and fluid inking in programs like OneNote. Unlike other Atom-powered tablets we've used there's no freezing as OneNote saves text, making this ideal for note-taking in meetings or out and about. Finding AAAA batteries for the pen is a little hard, so we'd suggest stocking up in case you need to replace one on the road. The tablet's own battery life is good, with more than 6 hours' usage when working with it steadily (with Wi-Fi off and a low screen brightness you should get most of a working day). Although the X11 responds well to touch, a screen of this resolution running Windows 7 can make for very small touch points on menus. There are two options: one is to use the pen for menus; the other is to switch to one of Windows high-DPI settings, which gives you a larger touch area, with larger menus and icons. We prefer to use the pen to take advantage of the screen real-estate; we also recommend ensuring that the pen is regularly calibrated to make sure you have the best possible accuracy. You can simplify things still further by using the built-in fingerprint reader to handle logging onto sites and services, using it instead of typing usernames and passwords. The screen itself is good, if a little on the glossy side, with a very large bezel (making the X11 look rather like a larger version of RIM's PlayBook). As a result, it's hard to use the X11 by a brightly lit window, and it's easy to see fingerprints — you'll probably want to keep a micro-fibre cloth to hand! One surprisingly absent feature is an SD Card slot, so if you're using the X11 with a camera you'll need a USB adapter. You'll probably also want to invest in a USB-to-Ethernet adapter, as the folding stand is just a stand — it's not a dock. There are three versions of the Kupa X11, with different specifications. We looked at the Pro, which has a 64GB SSD and a built-in 3G/Wi-Fi card, running Windows 7 Professional and shipping with a trial copy of Microsoft Office. Pricing is good, the Pro ships from Germany and costs €846 (inc. VAT; £704) and shipping. With Windows 8 round the corner, this could be an excellent device for trying out its new touch features.